A few months back I bought a babydoll dress that I loved and wore all the time, that is, until I accidentally shrunk it in the dryer. Now it’s literally a dress for a baby doll. Instead of going out to buy a new one, I figured I should just learn how to make one with a pattern I can use forever. This dress is pretty easy to make, and is nice and stretchy so you can easily throw it on and head out. I plan to make so many more for this summer. 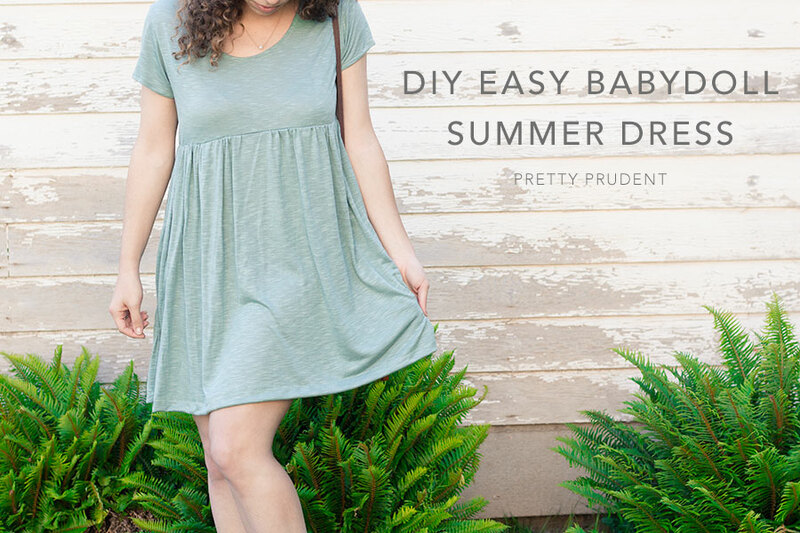 – DIY Easy Babydoll Dress Pattern (Size Small), a 1/2″ seam allowance is included in the pattern. Start by washing and drying your fabric. Next, cut out the pattern and your bodice pieces. Cut two 20.5″ x 34.5″ rectangles for the skirt. Sew the shoulders together with right sides facing. 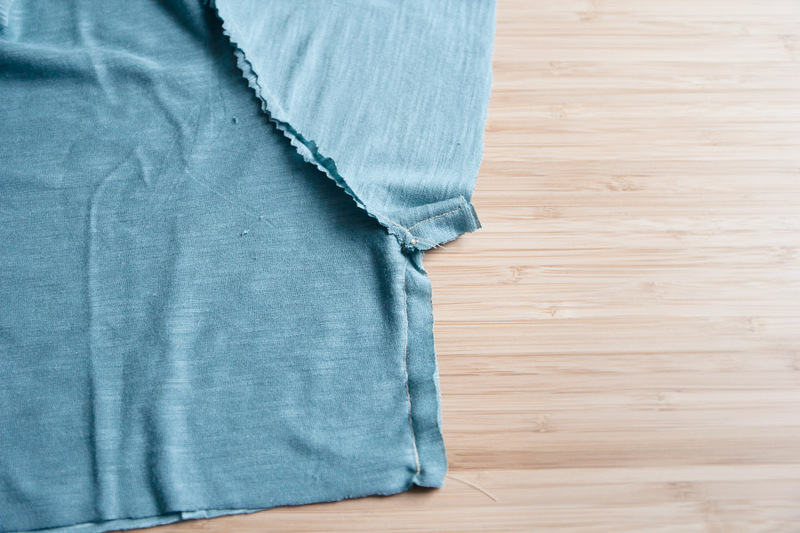 You can finish your seams with a serger, though it’s not needed since this fabric will not unravel. Lay the bodice out flat, and sew the sleeves in place with right sides facing. Sew the bottom of the sleeves together, and then sew down the sides of the bodice. I used pinking shears to reduce the bulk of the seams as I went, though it’s not necessary. 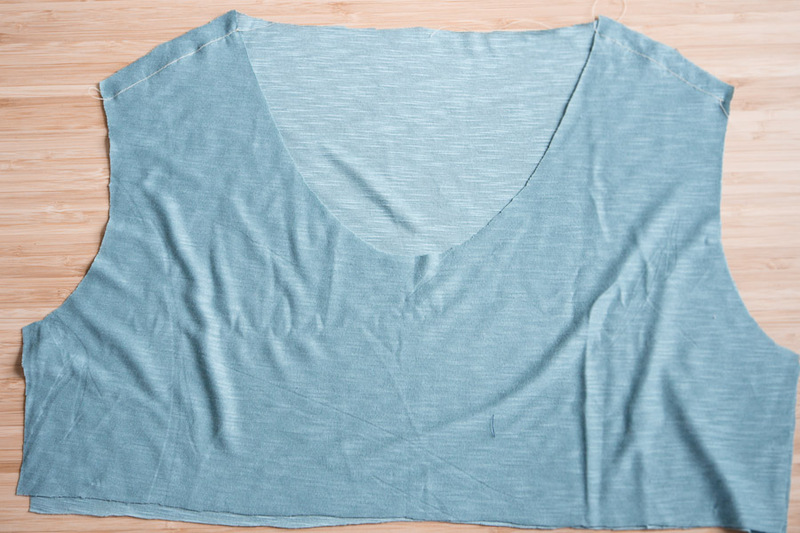 Flip right-side-out and hem the edges of the sleeves and the neckline. 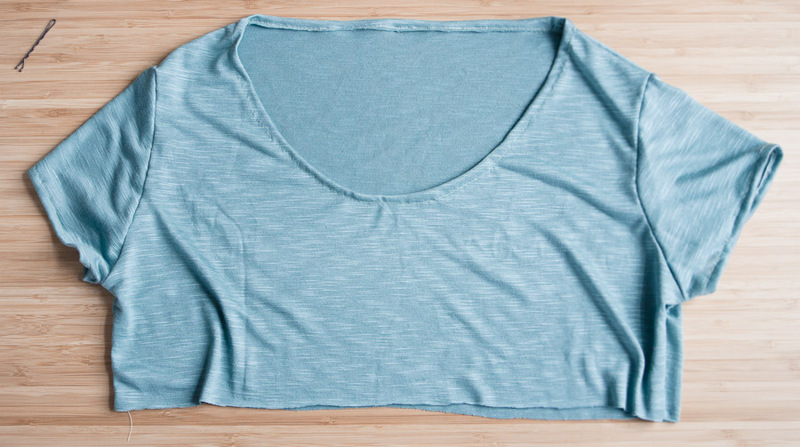 I hemmed by simply folding down the edges a 1/4″, pin, and sew. 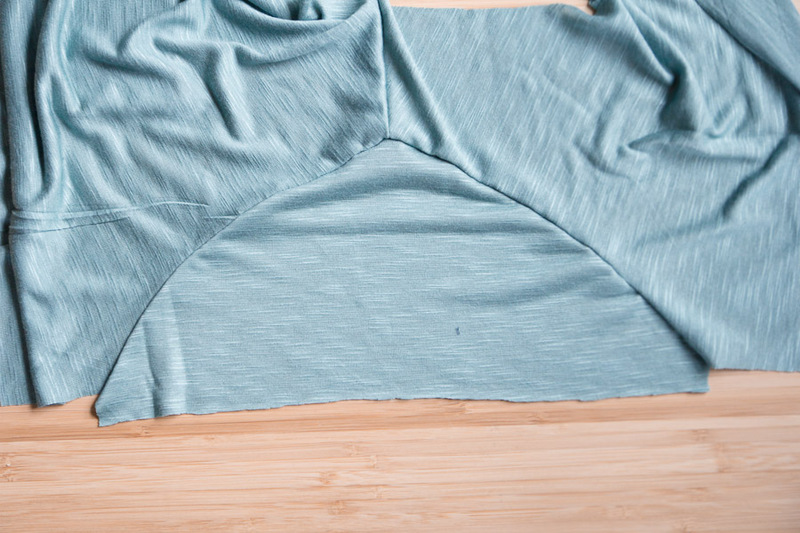 Hem the bottom (long edge) of the skirt pieces up 1″. Sew the two skirt pieces together along the edges of the shorter sides. Baste stitch the top of the skirt and gather. Pin and sew the skirt to the bodice. 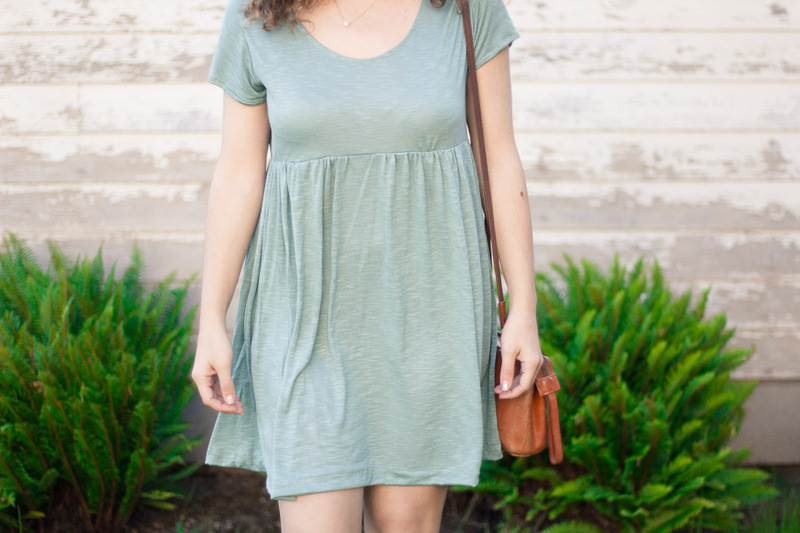 You can find detailed instructions on how to attach the skirt by checking out Jaime’s Beginner Jersey Baby Dress Tutorial. You can never have to many go to dresses, love them for summer. I’ll have to give this one a try for sure. I can’t wait to make one! I have a bunch of jersey knit in my stash that is crying out to ne made into these! I quit smoking almost 9 months ago and have put on a couple pounds, most of my clothes are snug now. This is so cute I want to make several but I must be doing something wrong, I can’t seem to find the pattern. Can someone point me in the right direction please? What measurements does the small size fit? Sorry, couldn’t find it in the post. I couldn’t find the link either so thanks for reposting. Also I’d also like to know what measurements this size small will fit. Thanks. Does it only come in a size small? I have the Brother PC 420 and I still love it to this day! Is the pattern only available in a size small? Loving this pattern! What is the approximate length of the dress? Is there any way to know if the pattern pieces are printing out at the correct size? I have printed it twice and made sure that it prints at 100%, but the pieces look too small to fit my teenager who wears a small. I would appreciate any help. This is for her Easter dress. I love that these instructions are so easy to follow, but the resulting dress was much too small to fit an adult… it was almost a child-sized dress with a longer skirt.